Our first two nights in Malaysian Borneo we stayed at Uncle Tan’s Bed and Breakfast in a cabin-like room with air conditioning – woo hoo! And a cold water shower – boo! Actually, the cold water would have felt great if we hadn’t had air conditioning in the room … We stayed there because it was close to the Sepilock Orangutan Rehabilitation Center and also because we had booked a jungle trip with them for the following two nights. The bed and breakfast included breakfast, lunch and dinner, which was nice because the cost of staying there and going on the jungle trip was way over our regular budget. On the plane to Borneo from Kuala Lumpur, Rand said, “Borneo is the place where budgets go to die.” Our budget was definitely dead after 5 days there. We ended up having to double our $100/day budget here with 2 nights at the bed and breakfast and 2 nights at the jungle camp. All our food was included, so are only extras were sodas, some supplies (flashlights and ponchos) and the entrance fee to the rehabilitation center (30RM/adult, 15RM/kids under 18). 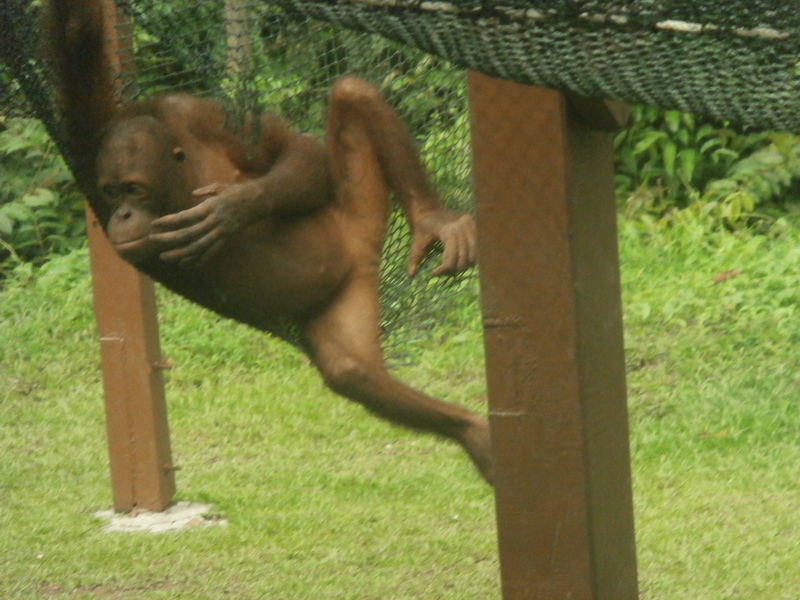 BUT, we got to see orangutans in their natural habitat! The center rescues orphaned or injured orangutans and helps them to return to the wild. This is not a zoo. The younger apes are cared for in a nursery, but the older orangutans are free to roam the forest and often only return for feeding times. After buying our tickets, we walked down the raised wooden walkway scanning the green leafy trees for movement. I wasn’t really expecting to see anything. I figured the feeding times were our only real chance to see the apes close up. But after we had been walking a few minutes, I saw something. Rand whispered, “Look.” And Kali’s eyes got big as she spotted an orangutan in the tree just next to the path. 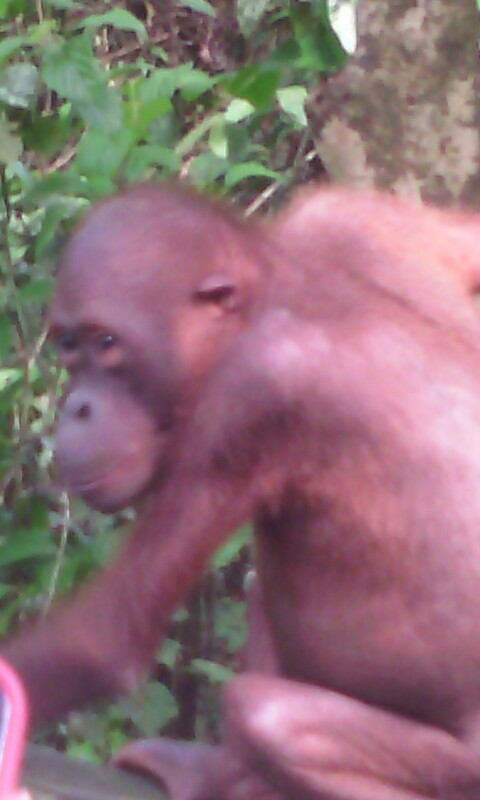 We watched for a minute or two, trying to quietly take pictures, before the orangutan swang away through the forest. We had a little while before the feeding so we went to the nursery. Oh my gosh, baby orangutan are so cute! We were so jealous of the workers who got to hold hands with them as they walked around the play area. Seriously young orangutan are so cute! The feeding times are designed to help the orangutan (and lure them out of the jungle for visitors to see), but not to be their only food. They are fed only bananas, so it will be boring enough that they will search the forest for their own food as well. During the morning feeding, two orangutans came to the platform and lots of macaque monkeys, but the afternoon feeding was when the real action happened. Rand said he would be so excited if a mama and baby orangutan came to the feeding that he would take off all his clothes. We didn’t hold him to that when not one, but two mamas with babies came to the afternoon feeding. 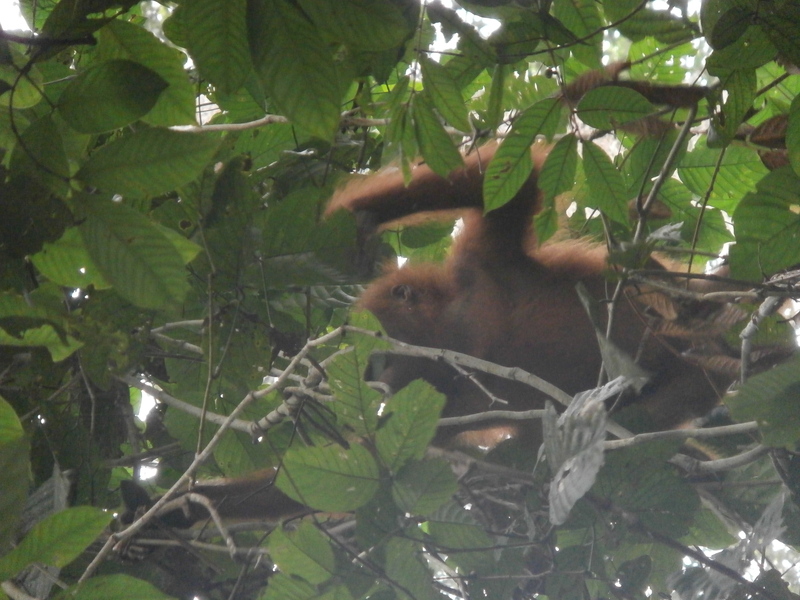 About 7 other orangutans also showed up, included a small hairless one that looked like an old man. As the feeding was winding down and the orangutans were heading back into the jungle, the old man ape came to the side of the walkway. A few of us noticed him and tried to get close-up pictures. Then he climbed on the railing of the walkway and began making his way down the path. He had gathered quite a few followers by now, but we all gave him space. Slowly and quietly we followed him, with a worker watching us to make sure no one did anything stupid. Up until then, it felt a little like we were at a zoo even though I knew that the orangutans were going back into the jungle after the feeding. 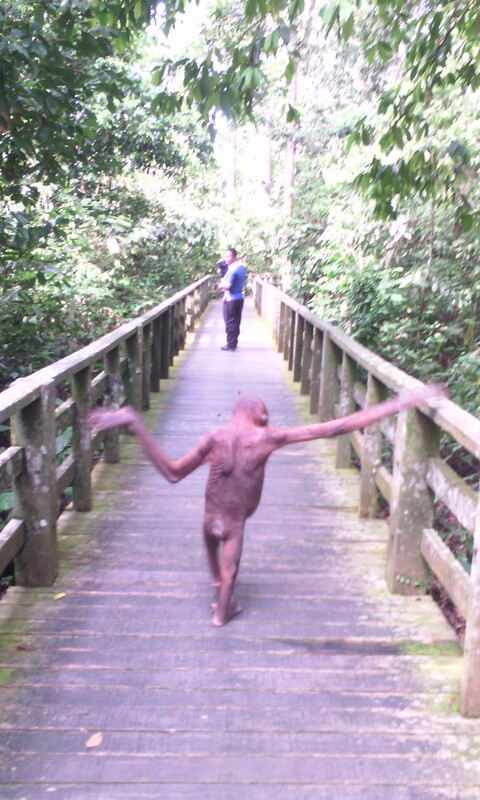 But seeing this ape, we found out his name was Solomon and he had always been hairless, just wandering down the path made me realize that we were in his jungle home. I was so glad we decided to stay the whole day instead of just seeing the morning feeding and then going straight to the jungle camp. Visiting the Sepilock Orangutan Rehabilitation Center has been one of our favorite experiences so far.